Given that the city has produced five Indian Nobel prize winners, Kolkata’s intellectual and cultural reputation precedes itself. And you can also soak in its colonial lineage, the clamour of cultural fusions and great food at every corner! A city that doesn’t push you to frantically check all monuments or go food tasting in a tizzy, Kolkata is meant for musafirs who would like to slow things down. Even 48 hours may end up seeming like too little, as you are sure to get hooked to its unique vibe. Keep both mornings for perfectly woven stories that immerse you in the history of the city - the heritage walks are unmissable. Take a walking tour that covers the colonial flavour, a peek into traditional Bengali culture, the confluence of many other communities and more. Photography enthusiasts could sign up for photo tours that offer anecdotal snippets and wonderful photo opportunities in the markets and hidden spots of Kolkata. The arterial Park Street of Kolkata is where one can sample the ambience and food at the historic food joints of the city. Flury’s for high tea, Mocambo and Moulin Rouge, Peter Cat for seafood, Olypub and Someplace Else are few of the pit stops that you HAVE to make. For authentic Bengali food, you may have to swerve away from Park Street and head to Bhojohori near Salt Lake and Kewpie’s Kitchen in Elgin Lane. As unfair as it might seem, do experience a hand-pulled rickshaw ride and even buy a souvenir, an original hand bell, which many rickshaw pullers are happy to part with for a price. And if you’ve always just heard of the big yellow taxi of Kolkata, hop in and lumber through the narrow streets which miraculously turn smoothen just when the traffic is unmanageable. For an even quirkier ride, a tram journey through the city is highly recommended. After all, the oldest operating electric tramway in Asia is in Kolkata. If you are the kind of traveller that finds markets a great way to experience the city’s local culture, you will have to pick from a long list of atmospheric shopping hubs. Of these, the Burra Bazaar, Bow Bazaar and New Market are the most famous. Look out for silverware, leather, antiques and what may seem like ‘everything under the sun’. 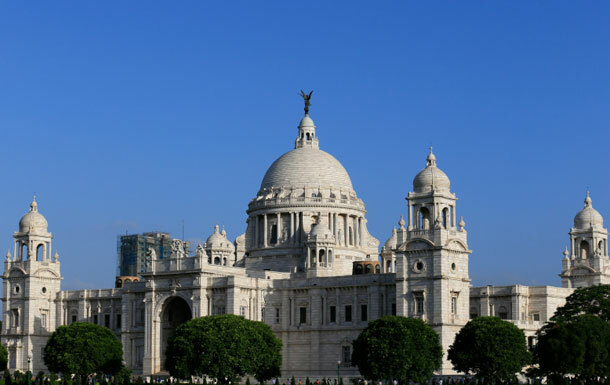 Of the rich architectural and historic heritage of the city, the top places to visit are Victoria Memorial, the Marble Palace, National Library and the famous Eden Garden stadium. The colonial tint is still intact in buildings like the Kolkata High Court, Raj Bhawan, Town Hall and the General Post Office.